In the upcoming issue of Practical Welding Today (March April 2015) you’ll see an article we did about helping Jeremy McGrath set up his welding equipment in his new race shop. If you’re not familiar with McGrath… well clearly you’re not a Supercross fan! He’s the winningest Supercross racer of all time, known as the King of Supercross, and his nickname is “Showtime” for his signature aerial move the Nac Nac. Jeremy’s now retired from Supercross but last year he put together an Off Road Truck Racing team Jeremy McGrath Motorsports (JM2). They race in the Lucas Oil Off Road Racing Series. 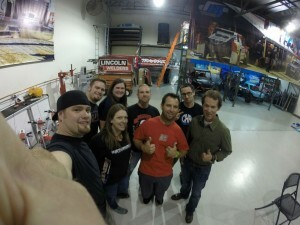 When Arc-Zone’s PRO Partners were in town we went up to Lake Elsinore to the races, and to tour Jeremy’s shop. I also went up to help him get his welding equipment dialed in for the work they’ve gotta do to keep their truck on the track. Lincoln Electric powered the team with the ideal set up for their weld shop: a MIG and a TIG welding machine, a Plasma Cutter, and even portable equipment for making repairs at the track. Jeremy says, “We beat the truck up pretty bad.” In other words, they have to check everything for damage after the race, and make the appropriate repairs. Those repairs can be almost anything, so their equipment needs to be ready to tackle a variety of projects and materials. The first thing I did (after ensuring they had all the welding safety apparel and personal protection equipment they needed) was to test their TIG / GTAW torch set up. 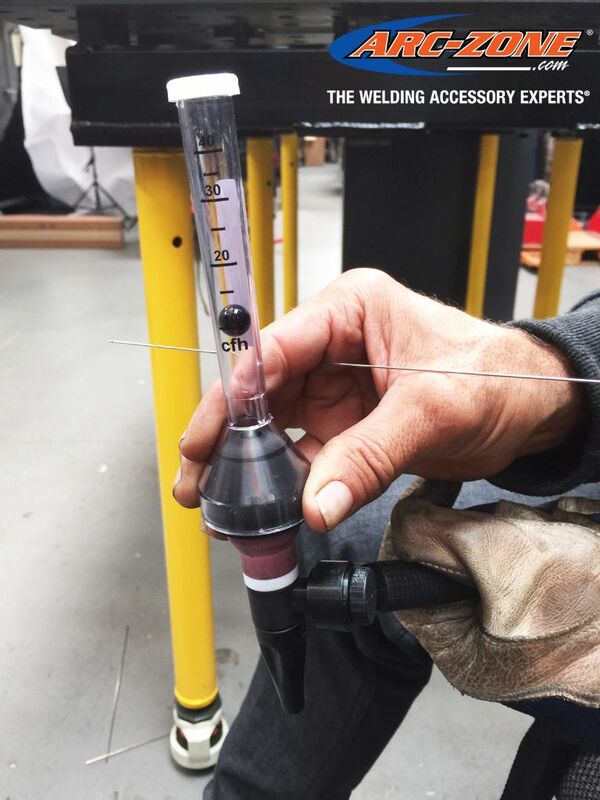 First I tested the water-cooler flow rate and pressure to their TIG welding torches. I then set the flowmeter argon flow rate, and confirmed the flow at the TIG torch gas nozzle (cup) using a shield gas flow tester. In this case the flowmeter was off by 5 CFH. These type of variations can cost you money, using more gas flow than needed, or quality problems — and — inconsistent welds with less gas flow than needed! I also made sure they had a PRO accessory kit for their TIG welding torches so their torches could be quickly dialed in for any repair scenario, on a variety of material types. Anyway, you can read more about Arc-Zone and Jeremy McGrath Motorsports in the upcoming Practical Welding Today. And if you’re not already subscribed–you should be!